We’ve slowly been picking up some old habits that were collateral damage from the dearth of time and energy in the early days of the twins’ arrival: baking, organizing school papers (bless you Container Store), dying my almost completely white hair on a more consistent schedule. Our next installment of normalcy is getting back to composting. Waste has always bothered me so we really try to reduce, reuse, and recycle in feasible ways. I’ve desperately wanted to keep this ethos when it came to the sartorial side of our family. Thankfully there are several awesome kids’ clothes consignment sales around us, friends that are committed to handing down (and taking our hand me downs), and I’ve fiddled with several consignment apps including thredUP. Even if the clothes are ‘fast’ or disposable fashion, it’s being used more than once. Even if it’s non organic cotton, less water is used if the garment has a couple owners. But I’ve been unable to reuse or recycle in my closet. By closet I mean the rolling coat-rack in our utility room given that our bedroom is smaller than my freshman year dorm. I’ve tried going to upscale and downscale consignment shops, but they were either too hip or frankly smelled too odd. Then it occurred to me, thredUP might be worth looking at for me. With slight trepidation, I hunted down brands that my impossibly well dressed colleagues wear (they are my life-line to anything current), and was thrilled to see gorgeous pieces. At great prices. And when I ordered them, I found the clothes to be odor free. 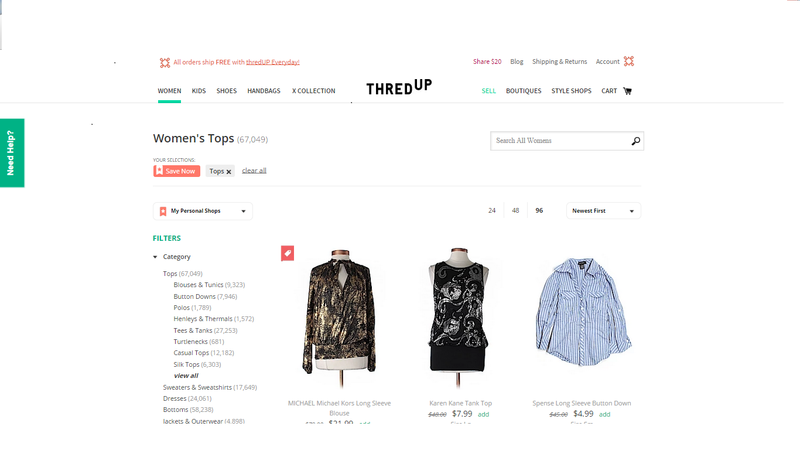 thredUP has a slick and mercifully spare UI, great search parameters, and offers Amazon Prime-eqsue free shipping with a small fee. Not only has my continual hunt for clothes been streamlined (how many sizes can kids go through?! ), but I can access the responsive site (mobile is just as great as monitor) at midnight when I take care of the non-laundry or housekeeping tasks. Most importantly, I have been able to lessen our family’s environmental impact just a little bit more, with flair.